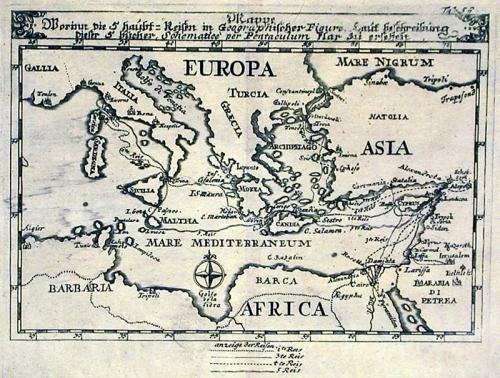 A map of the Mediterranean showing the track of the pilgrimage taken by Father Angelicus Maria Myller, to the Middle East. Between 1725 to 1727 Father Myller journeyed from Livorno to Jerusalem then on to Troy, Gallipoli and Constantinople. From Constantinople he travelled to Egypt and then to Syria. Finally from Syria he travelled to Malta and back to Livorno. Father Angelicus Maria Myller was a member of the Order of Friars known as the Servants of Mary or the Servites based on Mount Senario near Florence. Still discernible is a correction to the plate of the track from Crete to Malta. From a book by A M Myller recounting his travels. Scarce.